Just back from another whirlwind trip to the US. While I was in NYC I stopped in at La Colombe in Tribeca to visit Doug Wolfe – the barista we heard from in this podcast. He made me a delicious gibralter and then we talked about – you guessed it – coffee, as well as travel, and the various projects we are working on. Then Doug went into the back of the shop and brought out an advance copy of the book he did the photography for. The book is called il Viaggio di Vetri and Doug’s photos are on the same high level as the coffee he makes. I have neither read the book nor tried the recipes yet but the food, bathed in kind, natural light, looked absolutely delicious. Doug spent more than a year photographing on location in both Italy and the USA. 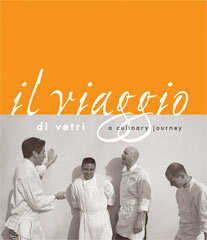 The book itself is by chef Marc Vetri of the highly-acclaimed Vetri Ristorante in Philadelphia. You might ask what this has to do with coffee or cafe culture – or even baristas for that matter. The very essence of a successful cafe is that it connects people over expertly-prepared drink and food in an environment that has a calculated aesthetic. Doug seems to accomplish all this whether it be coaxing espresso-based drinks from his beloved Faema e61, making photographs with his medium format camera, or just plain chillin’. You can purchase the book directly from Ten Speed Press. The above image of the book cover was taken from the Ten Speed Press web site.